Region: This Caterpillar is found in California and the Pacific Northwest. Life cycle: This insect produces one generation each year and overwinters as a larvae in the bark crevices of host plant. Physical Description: This 1/4 inch long caterpillar is cream colored with white stripes down its sides. 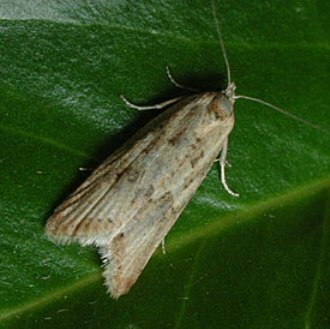 The adult moth is also tan with darker marks on the fore wings, which span 1/2 an inch. The eggs are laid on rough wood or on the bark of nearby trees. Feeding characteristics: This pest attacks bean, pea, strawberry, and filbert plants by making a web and feeding on the foliage and fruits. The damage occurs in late April and May. Controls: When only a few plants are infested, pinch off all and destroy all the affected leaves and branches. For larger scale problems, dust plants with a mixture of equal parts of ttobacco dust and pyrethrum powder. Or spray with a mixture of pyrethrum and rotenone. Dust or spray twice, 30 minutes apart. The first application will drive the caterpillars out and the second will kill them. Bacillus thuringiensis and sabadilla can also be use for large problems.